Don't just toss your soccer balls into a corner of your garage, or bury them in a dirty bag or container somewhere. Use this stylish storage device to get them off the ground, keep them visible, and eliminate clutter. One simple motion will allow you to quickly insert a ball into this holder, and the clever design will keep it securely in place until you take it out. Removal will be just as fast, and the high quality materials ensure that no matter how many times you take it in and out, this holder will still grip the ball just as tight. 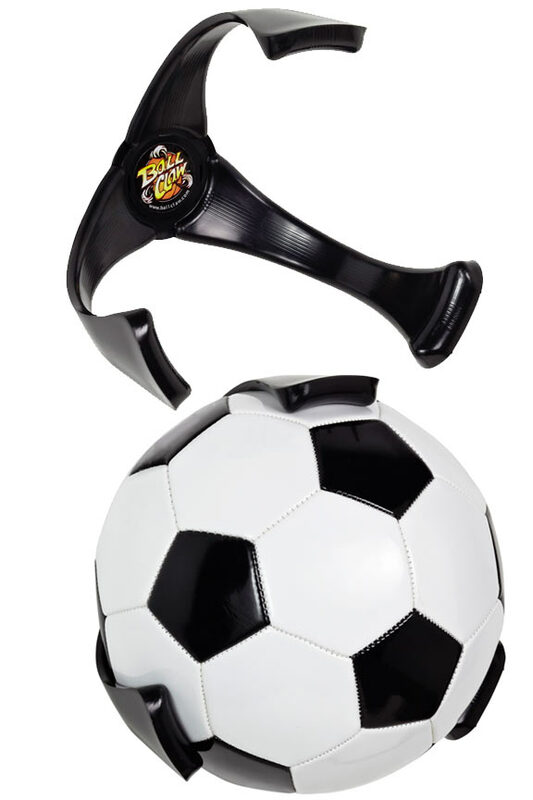 The Soccer Ball Claw works on #4 and #5 soccer balls, and can even be used for volleyballs or youth size basketballs. 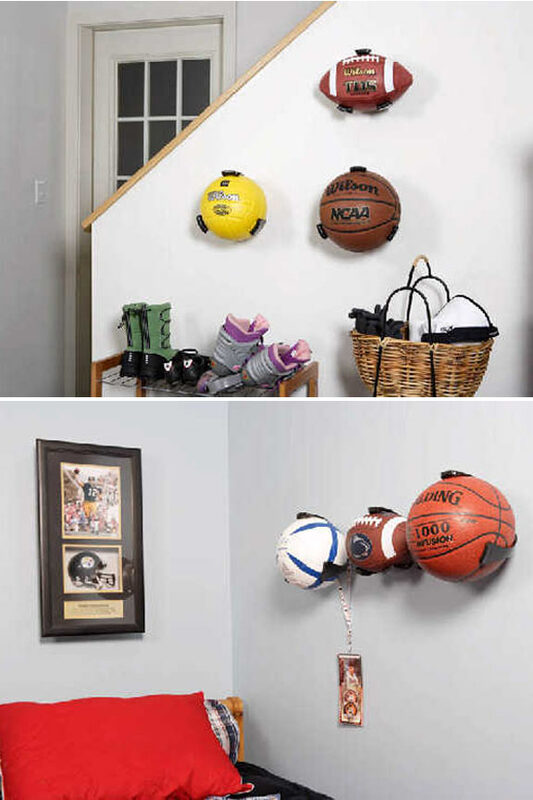 Mount one in your office to display that collectible game ball, or install several in your garage or basement to organize the balls that your kids play with. No assembly is required beyond mounting it in the desired location, and all of the hardware necessary is included with your purchase. Chances are you also have other types of balls adding to the clutter, so you may be interested in the basketball and football versions as well. The Ball Claw is essentially a three pronged "claw" that you can install on walls, ceilings or even poles with additional hardware. It mounts at the center with screws that are included, and is made of high quality plastic. To install it on your wall, simply pop out the center cover, and then insert the three screws into the corresponding holes. Once secured tightly, pop the cover back in to hide the screws. Protruding from the center of this holder are three curving arms with large, rounded tips. Each of these arms are strong and sturdy, yet slightly flexible. To insert a ball, simply press it straight into the holder. As you do this, the arms will stretch outward to allow the soccer ball to slip over the rounded tips, and into the claw. As soon as it is all the way in the pocket, the arms will flex back to hold it securely. This action requires no excess pressure or special technique. Even small children can quickly remove and replace balls when using this holder. It is fun to use, cool to look at and offers a faster and more efficient way to store your soccer balls. If you are trying to de-clutter your garage, or clean up your shed, this product is a great choice. It works just as well as an elegant display device or a storage and organization tool. It has the ability to eliminate annoyances like digging through buckets, or looking under shelves because your ball will always be highly visible, and neatly out of the way when you are not using it. This holder also makes retrieval easy too. Instead of fumbling around like what is common with other containers and racks, this one makes the whole process faster and easier, and due to the design it can be used just as easily by kids and their parents. The versatile mounting capabilities also allow you to hang it at any height, and in almost any location. With a slight modification, you could even stick one right to a goal post to hold extra balls while practicing, or to store them when not in use. Line the wall or ceiling in a child's room for a unique decorative touch, or use in your basement playroom to hold indoor friendly balls with similar dimensions. Because it straddles the line between decoration and storage rack, the possibilities are vast with this clever holder. Order Yours Today! 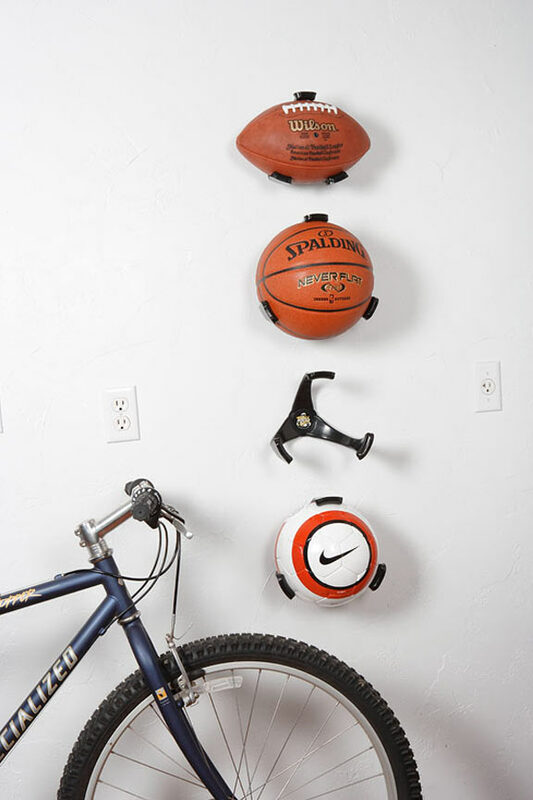 Dimensions 8" x 6.5" x 8.25"
Uses Mount to walls or even ceilings for storage and organization of sports balls. Also great for displaying autographed or collectable balls. Lightweight Yes - durable materials are light and long lasting. Hang almost anywhere without worrying about the bulk. Rounded Claws Yes - Three rounded tips will gently grip and hold your ball making it easy to insert or retrieve without compromising security. Assembly Required No - Holder is one piece. Claw only needs to be mounted in chosen location. Soccer Ball Claw - A clever holder that almost disappears when in use. 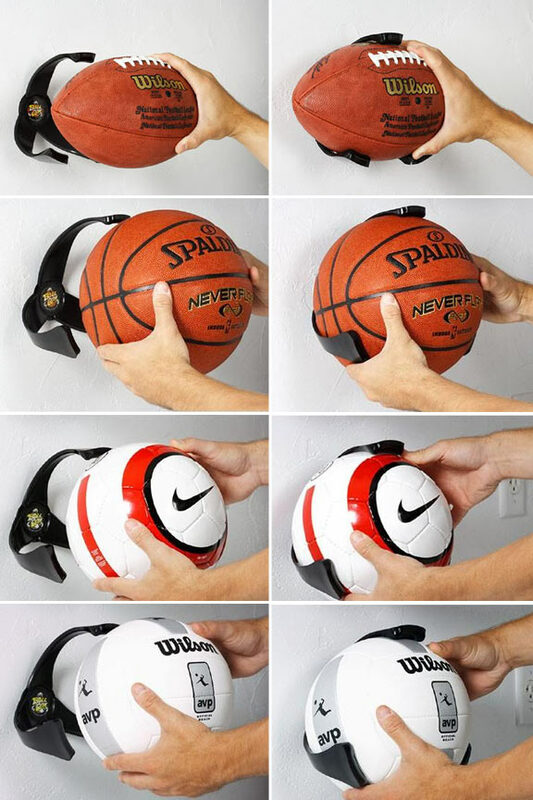 This ball holder and storage device offers a quick and easy method to organize your sports balls in order to reduce clutter, save space and keep each one visible. Order Yours Today! This ball claw is great! Easy to install and is very sturdy. The only complaint is it took 3-4 weeks to receive the product. Other than the wait, the product is just as I expected, and I will be adding more to our garage wall for the ball /helmet storage. I am very happy with my purchase of the soccer ball claw. I am able to display my daughter's NWSL autographed soccer ball as well as her team's signed volleyball. They are on the wall, out of the way, yet allow her to enjoy them. The claw was easy to install, and affordable to get more than one. Great product! This is the coolest idea ever. Very pleased with the quality and how it looks on the wall. These ball claws are awesome. They do everything that they are supposed to do and they are very easy to put up. I love them! The order process was easy and simplygoodstuff provided excellent customer service. I bought these as coaches gifts to go with signed soccer balls and every coach loves it. Everyone thought it was an amazing idea. Works great. I bought it for a size 4 soccer ball and it isn't tight around the ball, but still ok. Product arrived as described and in great condition. Its great to show our collectie we have now 25 of it and i will order more soon. What are the cost's if i take 87 of this claw's include shippung to netherlands ? Add to cart for an accurate quote. Due to the order size, if you place it over the phone, we could offer an additional discount. Large Cord Clamp. A Quick & Easy Way To Keep Cords Organized. Protect And Keep Cool. A Safe And Easy Way To Transport Wine Bottles. Keep Your Beverage At The Perfect Temperature And Serve It With Ease! A Freezable Interior And A Thick, Insulated Exterior With Handle For Serving. Organize, Secure and Store Up To 20 Shovels.